"I accidentally lost all data on my iPhone. All my photos, music files, video files are gone. Those data are very important to me. I desperately need a solution for me to restore my iPhone. How do I restore my iPhone from iTunes?" one of my dearest friends one day came to me for assistance in restoring his precious iPhone data. There are many ways to restore iPhone data. Of course, many people would choose to restore iPhone from iTunes backup if so lucky they have iTunes backup. People restore iPhone from iTunes for various reasons. It could be because they purchased a new iPhone and need to restore content to the old one, or their iPhone had issues and the only solution was to create a backup, format and restore back the content. Here in this post, people can find how to restore iPhone from iTunes backup. iTunes itself is a good way for people to restore iPhone although iTunes is not an essential part of the iPhone experience. Process of Restoring iPhone from iTunes backup with iTunes itself can be complicated, but it is absolutely effective for people to achieve iPhone restoring aim. Follow the step-by-step guide below to restore your iPhone from iTunes backup, be it old iPhone and new iPhone. 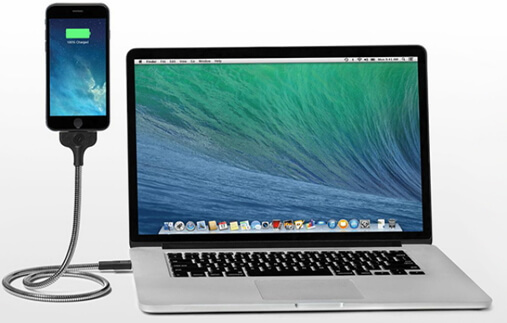 Step 1.Connect your iPhone with a PC or Mac running iTunes with USB cable. Step 2.After you agree to sync your iPhone to iTunes, you will be led to device summary page in iTunes, where there are many options including "Back Up Now" and "Restore Backup". 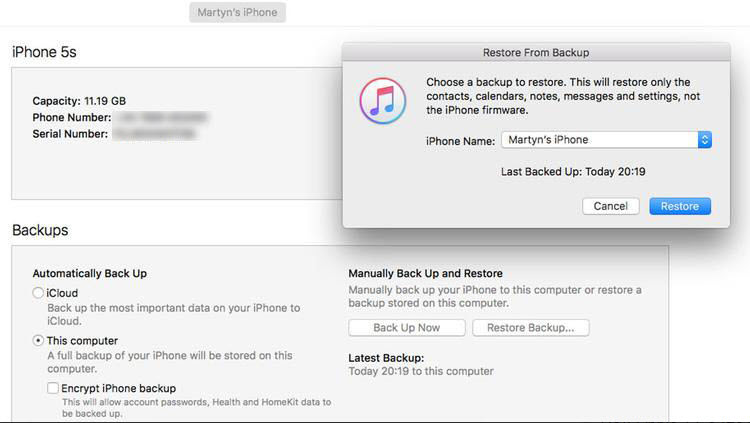 Click "Restore Backup" to start restoring iPhone from iTunes backup. Please kindly take note "Find My iPhone" needs to be disabled before you restore iPhone from iTunes backup. Step 3.A window will pop up after "Restore Backup" is clicked to let you select which one for restoring back to iPhone. Just select and click "Restore" button. It will take a while for your iPhone to complete the data restoring process. After it finishes, you can disconnect the iPhone with your computer and you will find all data are back to your iPhone. The method above is effective but complicated to some extent. iTunes' inability to facilitate transfer of files between devices has been a pain point for users since forever. Some people may prefer to simplicity, therefore they are looking for a more effective way to restore their iPhones from iTunes backup. Actually, Apple is not a company that changes its ways easily. Hence, the need for third-party apps such as iMyFone TunesMate arises. iMyFone TunesMate is an easy alternative to iTunes. TunesMate is a third-party iTunes alternative for Windows & Mac users with iPhones, iPad, and iPods designed by iMyFone. iMyFone TunesMate iPhone Transfer lets you restore from iTunes backup, transfer music, videos, and other files between your iOS device and your iTunes/computer. With iMyFone TunesMate, you will be able to synchronize iTunes library to your iDevice, and even rebuild damaged iTunes libraries to get back up and running quickly. Best of all, iMyFone TunesMate is incredibly intuitive and easy to use. 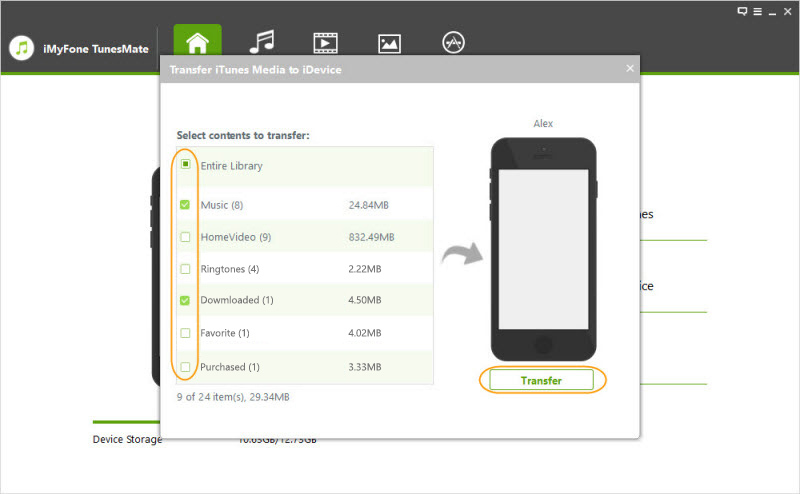 Transferring files between your iOS device and iTunes/computer is as easy as dragging and dropping them, with the two-way transfer. Two-way restore data: restore iPhone from iTunes/Computer, and restore iTunes from iPhone/iPad/iPod. Various files supported for restoring: able to restore music, movies, playlists, audiobooks, podcasts, TV shows, iTunes U, ringtones, photos, and many more. Restore files to iDevices from many sources: restore files to iPhone from computer/iTunes library/CDs/external hard drive/other iOS devices, etc. No data loss: restore files to iPhone without delete any old files even when iPhone is already synced with another iTunes. 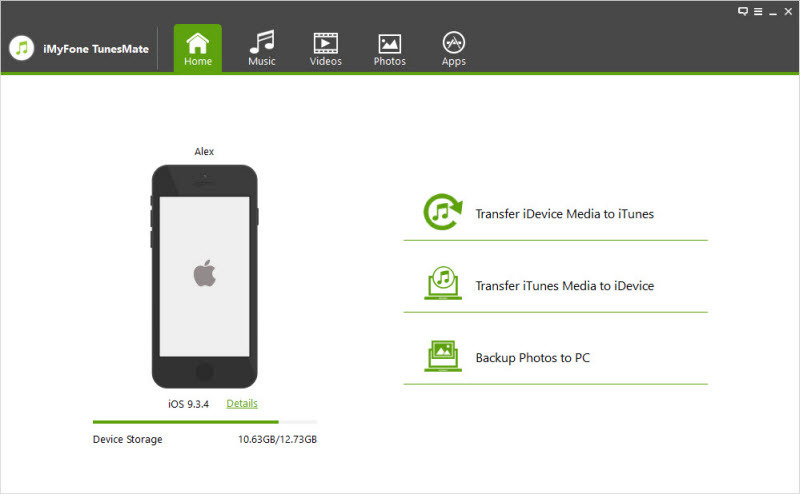 Back up and restore data at ease: back up iPhone data and restore backups when you need. iTunes library Restorable: Restore iTunes library no matter how you lost data or library in iTunes. How to Restore iPhone from iTunes Backup with iMyFone TunesMate? Step 1.Connect your iPhone with your computer with USB cable, and launch iMyFone TunesMate. Step 3.By default, the “Entire Library” will be ticked. You also have the option to untick some files if you do not want to transfer to your iDevice. Click on “Transfer” to begin the transfer of selected files to your iDevice. Step 4.Click “OK” to finish the process. See? It is much more easy and effective to restore iPhone from iTunes backup. In most occasions, iCloud backup function is automatically enable. iCould will automatically back up when your iPhone is connected with power source with screen locked under WiFi connection. 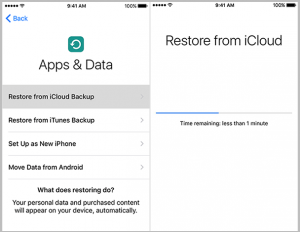 When your iPhone data get lost or you switch to a new iPhone, you can also restore iPhone from iCloud backup. Here in the following, we take restoring a new iPhone from iCloud as an example. Please check the step-by-step guide below to restore iPhone from iCloud. Step 1.Turn on your new iPhone. When you see the "Hello" screen, press the Home button. Step 2.Select a language. Select a country or region. Choose a Wi-fi network and sign into it. Enable or disable Location Services. Set up Touch ID. Step 3.When you get to the "Apps and Data" screen, tap Restore from iCloud Backup. Step 4.Enter your Apple ID and password. Step 5.Agree to the Terms and Conditions. Select the backup you want to use. 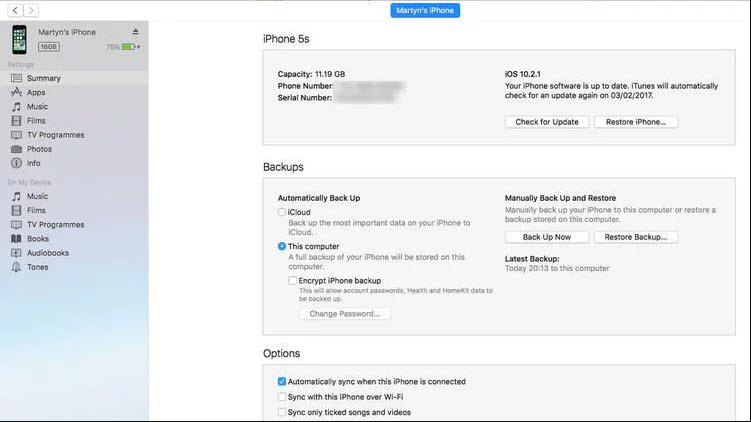 Tap Show all backups to view older backups stored in iCloud. It will take a while to restore your backup from iCloud, so grab a cup of tea and go for a nice, healthy walk. After you return from the walk, you will find all data are back on your iPhone. Enjoy!